Our Property was built originally in 1875 as a group of four townhouses. The Daly Terrace Townhouse, as it was known, was erected by the prominent Daly family. Construction was supervised by Stratford's Mayor and Perth federal MP Thomas Mayne Daly. His son, Junior, had many successes including being the first Manitoba MP to sit on the federal cabinet. The property has been home to three past mayors. All of the original hardwood flooring, high ceilings, and country elegance remains in the quaint twelve rooms now occupying Daly Terrace. 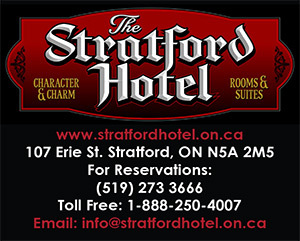 The Stratford Hotel held the offices of the Stratford Festival of Canada. The front of the building held offices and the box office while the back was used for wardrobe and props. The wonder of the Stratford Hotel is that even though it has been 125 years since it's construction, it remains a beautiful building. The Stratford Hotel has the honour to be designated as a heritage building by the Ontario government, and the designation will protect this building for years to come.